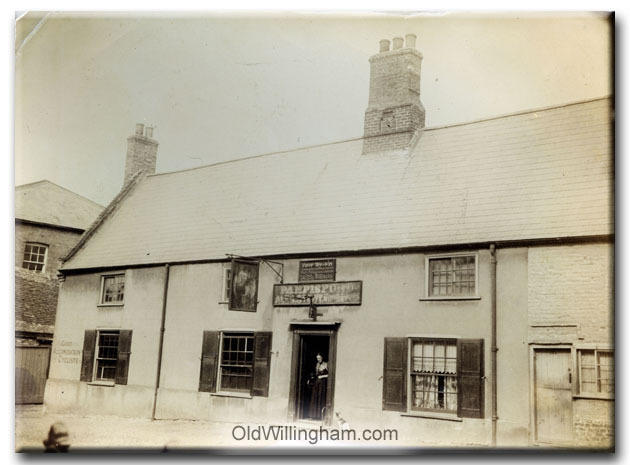 This month we see one of the many pubs and inns that existed in Willingham around 1900. Willingham had been a staging post for travellers for centuries resulting in many hostelries. In the 20th century, after the arrival of the railway and the building of a new road north from Cottenham, business declined but even as late as 1995 there were still five pubs open. Here we see The George which was (unsurprisingly) on George St. The buildings are still there today. The sign above the door reads: “Pampisford Ales, Stout, Wines & Spirits” and the proprietor is “Fred Walden.” The pub sign is almost illegible in the photo but the rear legs of a rearing horse can be seen so this is likely a picture of St. George and the dragon.